April 2018 - Sawtooth Mountain Maple Syrup Co.Sawtooth Mountain Maple Syrup Co.
At least for northern Minnesota we are indeed experiencing a repeat of earlier season weather. However for the Sawtooth Maple Syrup gang there hasn’t been much of an interrupt – we never did got off our snowshoes. Hello everyone, here is our sugarbush update! 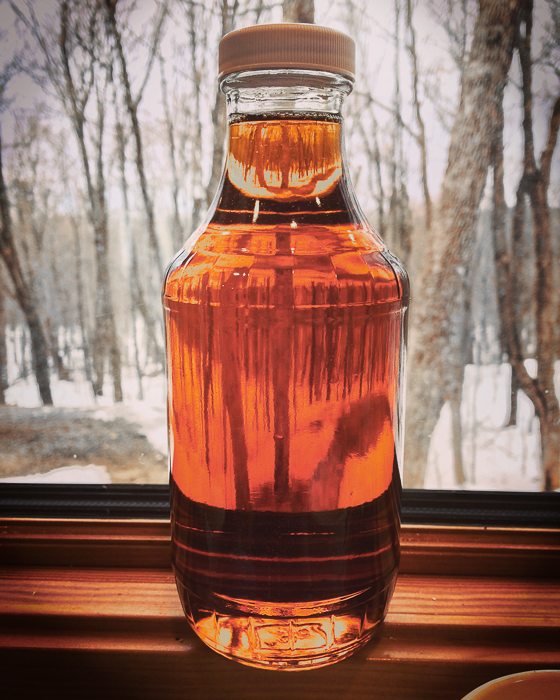 We have indeed been making pure maple syrup, and the lovely bottle shown below is evidence of what we have been making. This sample was pulled off the pan on Friday (Apr13) and is a medium amber with an incredible flavor I call “immaculate maple”, and graced with the color of a fine Cognac! Click the image to get the full experience. Yes it has been a long season, even though for some or most sugar makers the sugaring season hasn’t really started. We expect to see real results this week as the temperature trend is swinging up to the low to mid forties for daytime highs and freezing temps at night – perfect! On another note, I owe a heart-felt apology to the Yellow-Bellied Sap Sucker. In my last post I reported some of the issues we were experiencing in the field. 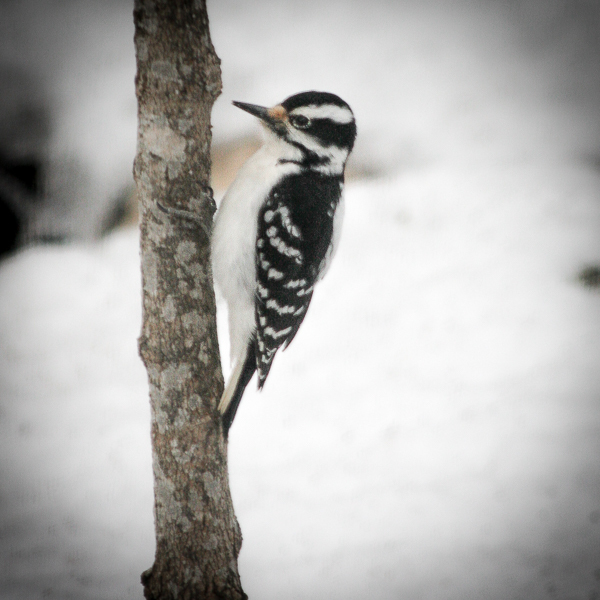 Namely the bird bites on our spouts and we discovered the real culprit to be the Hairy Woodpecker (see below). Seems our white spouts have been mistaken for bits of suet (my thinking). We really don’t know for sure what’s driving them to hammer out hundreds of spouts. We’ll take any hypothesis you may have and a solution to the problem will get you rewarded with a pint of the above “immaculate maple” syrup. At any rate, I’m sure the sap-sucker is relieved to be acquitted of all charges. Though there seems to an extension of Winter, we don’t really believe spring has been cancelled and with this recent snowstorm, the trees will be on ice for a little longer making our season a little sweeter. Stay positive on your sugaring front, my gut tells me we’re all going to have a wonderful harvest.